Clean, polish, whiten and detox your teeth - naturally! 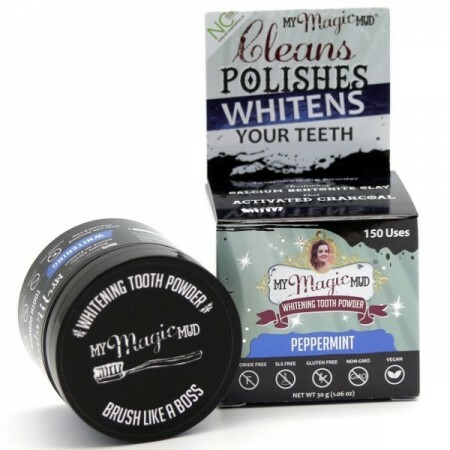 My Magic Mud natural teeth whitener and toothpaste is the original and leading alternative to chemical teeth whiteners, which can tarnish enamel and cause harm to gums. Use in place of toothpaste at night. Lab tested to ensure it is safe for your enamel and will not cause sensitivity. Safe for kids and adults. Average 150 applications. After using Magic Mud's revolutionary formula, your teeth will feel polished and clean as if you had just visited the dentist. It is safe for all ages to use and the ingredients are so natural you could swallow them! There's much to learn about how this unique product works, so please read on. My Magic Mud Tooth Powder is the original activated coconut shell charcoal and calcium bentonite clay based tooth powder and has been lab tested to ensure that it is safe for your enamel and will not cause sensitivity. The high pH level will kill cavity-causing bacteria and can even eliminate “dragon” breath. In fact, countless customer testimonials suggest that regular use has actually reversed their tooth and gum sensitivity while boosting their oral health. How to use My Magic Mud: use this tooth brushing powder once a day in place of toothpaste. It is a dark ultra-fine powder blend, which we suggest using just before you go to bed, or before taking a shower. However, you can also use My Magic Mud in the morning, or if you wish to make your smile sparkle before going out - just brush lightly with toothpaste afterwards to remove any “mud” that remains. The “magic” in My Magic Mud Tooth Powder is in the simplicity of this blend, each natural ingredient playing an important part individually and synergistically. The activated coconut shell charcoal scrubs your teeth squeaky clean while actively detoxifying your mouth. It is a grit-free, ultra fine granular that is food grade and gentle on the enamel. Certified organic mint extract and certified orange peel extract are a natural anti-inflammatory and for added whitening power. Choose toothpaste that is free from synthetic chemicals and made from just four simple ingredients. Family business making the product in the USA. Deeply cleans and whitens teeth. Removes plaque, preventing tartar build up. Gentle on enamel (lab verified). High pH level and minerals may fight future cavities. 1) Open jar over sink carfefully. 2) Tap toothbrush bristles onto the tooth powder. Only use a small amount at a time! A little goes a long way. 3) Gently brush teeth for two minutes. 4) The longer the mud is in your mouth, the more beneficial it is for teeth whitening and detoxification. To release the mud from your mouth, either gently let the "mud" fall from your mouth into the bathroom sink, or jump in the shower and rinse down the drain. 5) Lastly, rinse your mouth with water, swoosh, spit, and continue until the mud residue has vanished from your teeth. For added oral hygiene, floss after use. 88ml (3oz). Approx. 150 uses. PP (no 5) plastic container with screw lid is 5cm height x 6cm width. 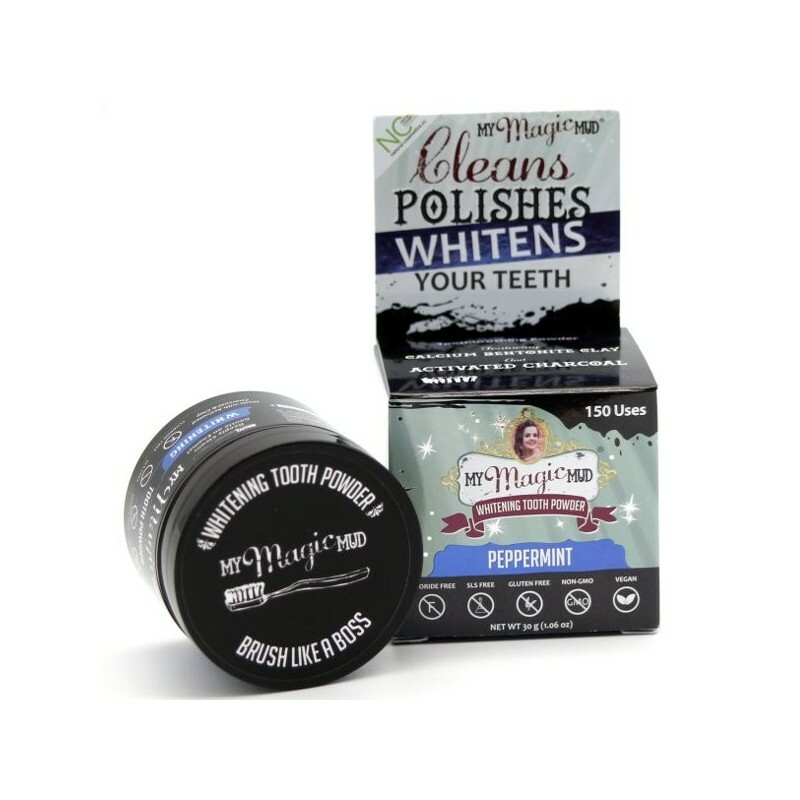 Ingredients: Organic Peppermint flavour, Non-GMO Xylitol, Bentonite Clay, Activated Coconut Shell Charcoal, Organic Orange Peel Extract Powder, Wildcrafted Mint Extract Powder.